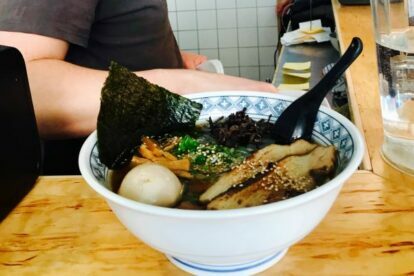 I went to Totemo Ramen on a lazy sunny Saturday morning following a friend’s tip. Wow, this place has definitely entered my top 10 list of all-time favorite spots in town. I haven’t tried all the ramen places in town (yet), but I’m pretty sure that Totemo is one the best. It has to be. Totemo Ramen is a tiny tiny place on Sankt Eriksgatan bridge (a street with a lot of record stores, just so you know), with a few tables outside, and seats at the counter inside. The menu, just like the place, is small (which usually is a good sign when it comes to food quality), the ramen is handmade (and you can definitely tell from first bite), and the guys running the place are fast and friendly. Despite the size and the hungry crowd it went pretty fast for me: I ordered my ramen, waited for 5 minutes to get the seat and after 10 I already had my generous, tasty ramen bowl. Easy. Author’s note: the pic does not do it full justice!